It was a great pleasure to associate with you. Our students had a informative session and they truly look forward for more sessions from you. Thank you so much for equipping our students and injecting confidence among them. Technospirit has done a great job in transforming leaders by identifying their inner self; especially in this current VUCA world. Deepak is an amazing experienced trainer and covered a diverse range of topics which catered to leaders; working in a meshed organization like Hewlett Packard. The 6 thinking caps was very useful and we will definitely apply that in our day to day life. Deepak is a “different” trainer, come much ahead of his time for Kerala. His style of training with combination of videos and group exercises kept all engaged throughout. The Heartfulness introspection that Deepak brought in is an unique differentiator which can make a real practical change in participants. All in all, this is not merely a theoretical training; rather a lively practical session which transforms the individual to a higher dimension. I recommend Deepak to anyone who needs to be transformed as a Leader. Kudos. 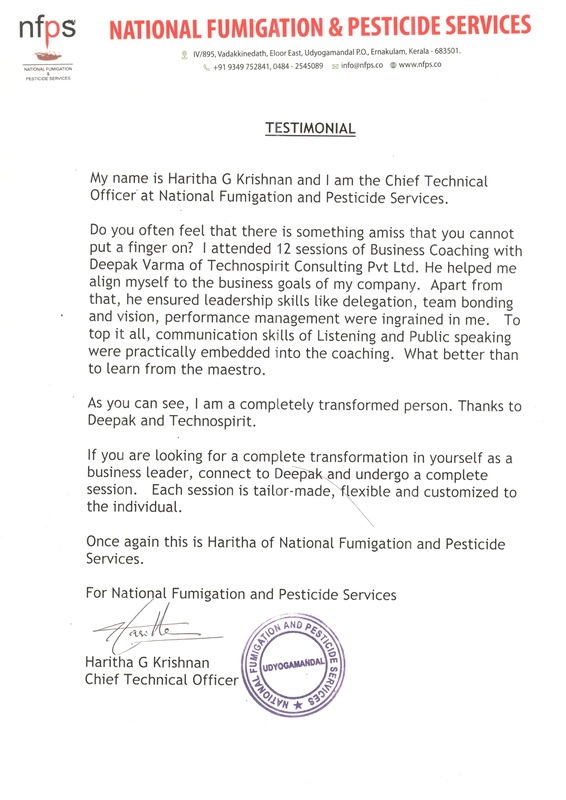 Deepak Varma led the program and completely transformed their attitude towards work. They came back charged after the program with an unseen enthusiasm. The techniques he taught them are unique and customized to their line of work and not part of any management course. There is an impromptu style which adapts to the environment. 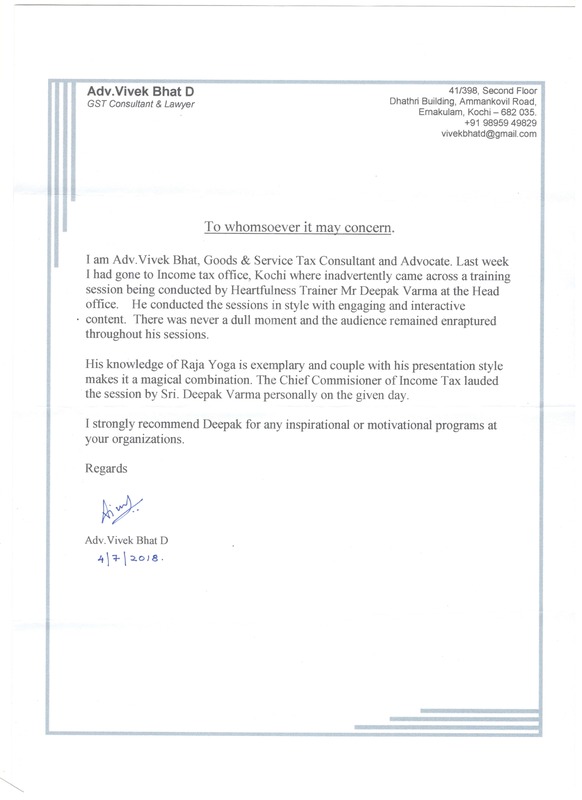 I strongly recommend Deepak to corporates wanting to transform their employees to a higher state of work. 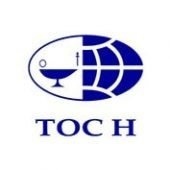 I guarantee the investment done at Technospirit will give multifold returns. Deepak conducted a 2 day Faculty Development (Train the Trainer) Workshop at Sahrdaya Institute of Advanced Studies. The concepts he taught were easy to grasp and today, even after 7 months; the teachers use some of the principles of Time Management and impart this to their students. It was a fun filled session with Role plays, Group discussions and Activities which kept all the participants engaged throughout the 2 days. Another unique feature that Deepak brings to the training is the Heartfulness Relaxation and Meditation techniques. He understands the psyche of the “student” and this is a big Plus in his training. All in all, I recommend Deepak for any program related to Student Development or Faculty Development at any college.